The Ascension of Christ doesn't get anywhere near the attention that it should. We celebrate the birth of the Lord Jesus Christ because we know what He accomplished. Without the Resurrection and Ascension, the birth of Christ would have no significance whatsoever. And sometimes that celebration of His birth gets filled with sentimental things about a baby in a manger and Joseph and Mary and shepherds and wise men. It’s a great true story. Unfortunately, many people never really get much beyond that sentimentality and limited knowledge about Jesus. If, on the other hand, the Church were to celebrate Christ’s Ascension, we would have a great holiday to celebrate all His achievements. Furthermore, unlike the date of His birth, which we don’t know and celebrate on December 25 to substitute the winter solstice celebration, we know the exact date of the Resurrection and Ascension of Jesus Christ. Celebrating the Ascension could be the greatest of all celebrations because Jesus ascended into Heaven, affirming that He is the Son of God, He accomplished everything He had come to do, and the Holy Spirit would now be with us. Jesus told His disciples in John 16:5-15, But now I am going to him who sent me, and none of you asks me, ‘Where are you going?’ But because I have said these things to you, sorrow has filled your heart. Nevertheless, I tell you the truth: it is to your advantage that I go away, for if I do not go away, the Helper will not come to you. But if I go, I will send him to you. And when he comes, he will convict the world concerning sin and righteousness and judgment: concerning sin, because they do not believe in me; concerning righteousness, because I go to the Father, and you will see me no longer; concerning judgment, because the ruler of this world is judged. “I still have many things to say to you, but you cannot bear them now. When the Spirit of truth comes, he will guide you into all the truth, for he will not speak on his own authority, but whatever he hears he will speak, and he will declare to you the things that are to come. He will glorify me, for he will take what is mine and declare it to you. All that the Father has is mine; therefore I said that he will take what is mine and declare it to you. The story of Jesus’ earthly life began when He left Heaven and came to earth. And it ends when He leaves earth and returns to Heaven. The story began with condescension and ends with Ascension. His story begins with incarnation and ends with coronation. It began with the Son of God being born of a virgin, descending to earth, and it ends with the Son of God being risen from the dead and ascending to Heaven. Luke 24:50-53 Then he led them out as far as Bethany, and lifting up his hands he blessed them. While he blessed them, he parted from them and was carried up into heaven. And they worshiped him and returned to Jerusalem with great joy, and were continually in the temple blessing God. When Luke recorded the birth of Jesus, he rooted the event in its historical setting within the Roman Empire. He continues that same preciseness at the end of our Lord’s earthly ministry by recalling the place of the Ascension - at Bethany. He dates the event in Acts 1:9 as 40 days after the Resurrection. Yes, the Ascension was a real event of history. Some people are puzzled as to why Jesus waited around on Earth 40 days after His Resurrection, but that period is no accident. Jesus had endured the Devil’s temptation for 40 days in the wilderness at the beginning of His public ministry, but now the tables were turned. In the post-resurrection period Jesus displayed His victory over the Devil and all his works. During this time, the conqueror of death revealed His supremacy to His faithful followers so that they might share in the joy of His victory. Those 40 days of His appearing after the Resurrection were of immense value to the believers, for they established the reality of His lordship. A single sighting of the risen Christ may have been open to question, but His continuous encounters with the disciples removed the doubts of the most skeptical among them and assured them of His power and authority. The Ascension will always remain a mystery, in a sense, because it’s beyond the scope of human experience. It takes us into the realm of the supernatural. It happened very simply and quickly. When Jesus had delivered His farewell message to the disciples, He lifted up His nail-scarred hands in blessing. Then His body commenced to rise supernaturally, and a cloud bore Him out of their sight. What a fitting end to His earthly ministry! It’s not surprising that the supernatural should be evident at His departing, for it was equally present in His birth and Resurrection. Just as in the virgin birth and the Resurrection, some would deny a literal Ascension because it’s unscientific. But these doubts are in the minds of worldly scholars rather than in the hearts of faithful Christians. It’s true that Jesus was making a series of appearances to His followers, but these encounters couldn’t go on forever. It would be odd if they should grow fewer until finally they petered out - that would only cause confusion and even loss of faith. Everyone would wonder and speculate what happened to Him. No, there had to an event dividing when the Jesus of Earth would become the Christ of Heaven. The Ascension was the only fitting conclusion to the life of Jesus on Earth. God isn’t the author of confusion. The disciples, who witnessed the Ascension, saw it as the occasion when their faith in a flesh and blood person, depending on His physical presence, was ended. Now they were linked to someone who was independent of space and time. But Luke tells us that the disciples did not leave the scene broken-hearted. They had a definite promise of the Holy Spirit and they were to go to Jerusalem to wait for this promise. The Ascension was the completion of the incarnation. 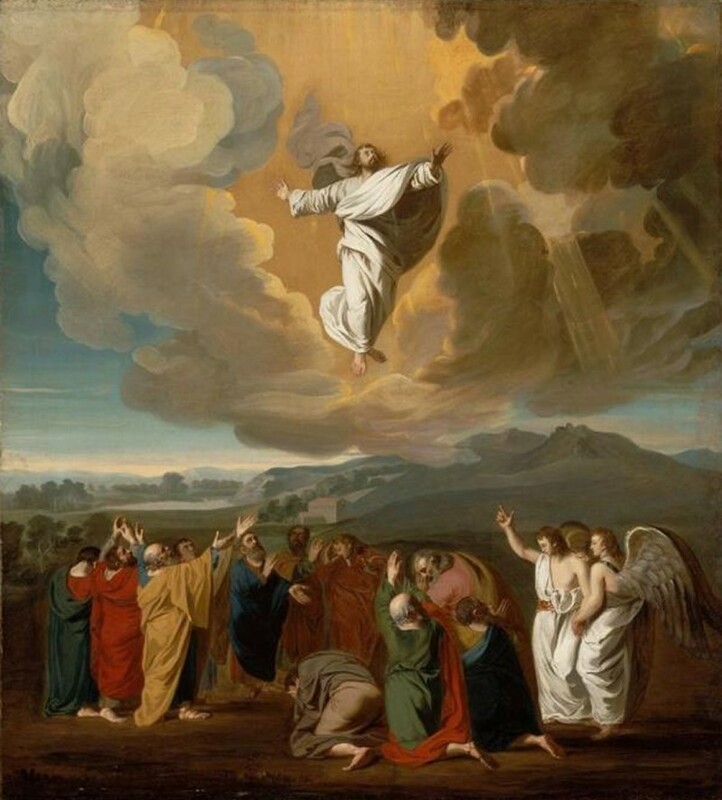 Jesus himself had predicted, John 16:28 "I came from the Father and have come into the world, and now I am leaving the world and going to the Father.” The Ascension gave the disciples great assurance that Jesus is God, who is now in Heaven, preparing a place for them to be with Him. The Resurrection and the Ascension can’t be separated. They form two parts of the one continuous glorification of Jesus. When Jesus met Mary Magdalene in the garden He told her in John 20:17 “Do not cling to me, for I have not yet ascended to the Father; but go to my brothers and say to them, ‘I am ascending to my Father and your Father, to my God and your God.’” This indicates the process of glorification had already begun with the Resurrection and would be completed when He was finally in His Father’s presence. The Resurrection and the Ascension are milestones in the process whereby Jesus - crucified, risen, and ascended - entered finally into the glory of God and is seated at the right hand of the Father, interceding for us! Mark 16:19 "So then the Lord Jesus, after he had spoken to them, was taken up into heaven and sat down at the right hand of God." What a revelation! What a victory! The crown of thorns was changed into a crown of glory! Psalm 24:7-10 Lift up your heads, O gates! And be lifted up, O ancient doors, that the King of glory may come in. Who is this King of glory? The Lord, strong and mighty, the Lord, mighty in battle! Lift up your heads, O gates! And lift them up, O ancient doors, that the King of glory may come in. Who is this King of glory? The Lord of hosts, he is the King of glory! This is a foretelling of the grandeur of the spectacle associated with the homecoming of the Son of God. The scene defies adequate description. As the conqueror neared the celestial city the heavenly heralds cried out in preparation for His arrival. Yes, Jesus had triumphed over Satan, the world, death, and hell. His Resurrection and Ascension proved He was the victor: "He is the King of glory!" The apostle Peter confirms this: 1 Peter 3:22 who has gone into heaven and is at the right hand of God, with angels, authorities, and powers having been subjected to him. The Ascension stands for the final liberation of Jesus from all limitations of space and time, so that He’s freed to be lovingly and powerfully present with every believer in every place, in every age. Actually, it’s a good thing that Jesus is not with us now in a human body and therefore limited to one geographic location. If He was, we would have as much chance of being with Him in our lifetime as we would a meeting with the President! We might get a five minute slot in His diary in 2030, but as it is, Christ the King is with us and in us by His Spirit every minute of every day wherever we go! The Ascension was the Coronation Day for Jesus, but we have to ask ourselves the question: have we acknowledged Him as our Lord and King; have we knelt before Him in glad allegiance? If we call Jesus our Lord, we have a responsibility to live holy lives. And if we sin, we must confess and repent, seeking His cleansing and forgiveness. The Ascension of Jesus makes it possible for Him to be close to each and every one of us, if only, we allow Him to be Lord in every part of our lives. The Ascension is not the end of the story of Jesus Christ for He is eternal life. The story is still being written through the lives of believers. Luke begins the “rest of the story” in Acts. It would be an over-simplification to say that the Lord’s Second Coming will be like a film of the Ascension played backwards, to return on the same spot, wearing the same clothes. No, we are told the whole world, living and dead, will witness His return. Rev 1:7 Behold, he is coming with the clouds, and every eye will see him, even those who pierced him, and all tribes of the earth will wail on account of him. Even so. Amen. The Ascension testifies to the fact of our Lord’s return, "He will come." The time is left open, and it’s futile and unprofitable to speculate as to when it will happen. Jesus told His disciples that not even He knew the day or the hour when the Son of Man would come. Stay awake! The certainty is there. God is working His purposes out for His whole creation, and when He is ready, our Lord will return just as surely as He ascended. The all-important, practical call of the Ascension is that we are ready for His return. Someone once said, "If I am always ready, I shall be ready when Jesus comes." The secret is to keep short accounts with God and our fellow men. In other words, if something breaks our fellowship with God or man, then immediately put it right. Are you ready? Are you redeeming the time until Jesus returns? Are we fulfilling the ministries He has given to the church? We have been placed where we are for a purpose. When He returns, will He find us fulfilling that purpose? Therefore, all of us should seek the promise from the Father—the Holy Spirit—so that we have power to be witnesses of Jesus Christ and grace to fulfill His purpose for our lives until He returns. If you are a baptized believer, ask the Father every day to fill you with the Holy Spirit. If you are not a baptized believer, then confess Jesus as your Lord and Savior. Give your life to Him and repent of your sin. Follow Christ in baptism and He will raise you from the watery grave, born-again of the Holy Spirit. Then you will have grace and power to tell others what Jesus is like and what He has done for you.